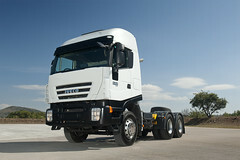 IVECO GREAT DEALS SPECIAL NEW YEAR: PARTS OFFERS! and make sure you are ready to be on the road! At Iveco, we help you to control and reduce your expenses. So whether you own a Daily, Eurocargo or Stralis, your Iveco dealer has prepared exclusive offers for you. Only available until the 30th of April 2015.